After years of having only one school, Tucson Unified School District decided it was time to open another high school to meet the growing need in. In 1953, construction crews broke ground to begin the building of a new high school to be located at 3645 East Pima Street. In January 1957, an only partially completed Catalina received a full student body. The students themselves helped move equipment and furniture to help make the transition smoother. Catalina High School, was designed by Scholer, Sakeller & Fuller, Architects, and was built by J. J. Craviolini and L. C. Anderson. It was named under a new board policy of calling the schools after local mountain ranges. Catalina was built as a showplace school for the times, costing $2,496,619, to which were added extra classrooms, locker and shower facilities and a science wing, totaling 73 regular classrooms. The school was controversial at first, with some critics calling it "Disneyland" because the architecture was viewed as lavishly modem and expensive. Catalina, which had been designed for 1,500 students, opened with an enrollment of 2,000. 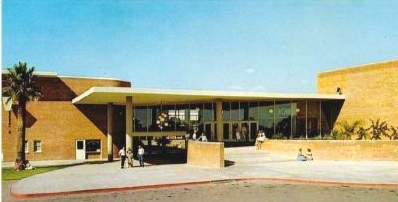 Prior to the completion of the building, students had attended Tucson High on split sessions, with Catalina students attending the afternoon session. R. T. Gridley was the first principal of Catalina. It would not be until 1959 that the original plans for the school were completed. In the sixties, Catalina went through it's golden years. During this time Catalina was known as "The Country Club School" for the upper class students that attended Catalina. During this time, Catalina would watch as many other schools began to develop in the Tucson Area, such as Sahuaro, Palo Verde, Canyon Del Oro, Rincon, and Cholla opened their doors to students. In 1968 Catalina received a new Principal, a former Tucson High Assistant Principal Derald Hendrickson. Mr. Hendrickson made it a mission to combat the threat of drugs on school campuses. Mr. Hendrickson implemented many policies still used by TUSD today.